An award-winning training provider has won a major contract to deliver apprenticeships to the Welsh workforce of the UK’s largest food service company. Following a detailed selection process, Compass Group UK & Ireland appointed Cambrian Training Company as its preferred training provider in Wales. Cambrian Training Company, which has offices in Welshpool, Llanelli, Builth Wells, Holyhead and Colwyn Bay, is delivering apprenticeships to the group’s new recruits and to upskill existing employees. Operating in the education, healthcare, business and industry as well as sport and leisure sectors, Compass currently has a small number of apprentices with Cambrian Training Company but is looking to increase apprenticeship opportunities in 2019. 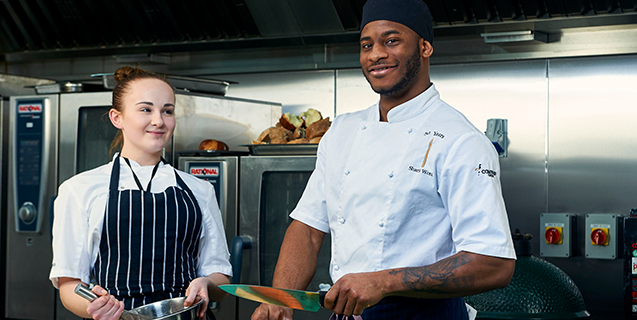 The suite of qualifications available to employees range from Foundation Apprenticeships to Higher Apprenticeships in chef, business and facilities management academies. “The reason we chose to work with Cambrian Training Company was the company’s consistent record for delivering quality teaching, learning and assessment,” said Jonathan Foot, Head of Apprenticeships and Early Careers at Compass Group UK & Ireland. “Importantly, the company understood our business culture and ethos and that came across very clearly when we met managing director Arwyn Watkins and his team. Arwyn Watkins, OBE, Cambrian Training Company’s managing director, said the company was delighted to be working with Compass Group UK & Ireland to deliver continuous professional development in Wales, utilising the Apprenticeship Programme. “Our focus is to ensure that we deliver innovative solutions to support Compass’ business and personal skills needs to improve business performance across the contract commissions in Wales,” he added. Cambrian Training Company specialises in the delivery of apprenticeships and employability opportunities across a range of industries pan-Wales. The company is renowned for tailoring training to meet the specific needs of employers and learners. Support services to employers include advertising job vacancies on their website free of charge. Each job is then linked back to the Apprenticeship Matching Service on Careers Wales’ website, which is used by thousands of young people. Employers can filter and review applications easily and shortlist and invite applicants for interview all from a personal area of the website. For more information, contact Katy Godsell, Cambrian Training Company’s marketing manager, on Tel: 01938 555 893 or Duncan Foulkes, public relations adviser, on Tel: 01686 650818.